Watch The Birdie Video Slot Guide & Review - Casino Answers! Watch the Birdie is a 5-reel, 15-line video slot developed by Rival, featuring expanding wilds, scatter wins and a bonus game. You can play the Watch the Birdie video slot at Bovada. Coin values on the Watch the Birdie slot machine are $0.01, $0.05, $0.10, $0.25, $0.50 and $1. You can select from 1-15 paylines and bet 1-5 coins per line. You can bet as little as a penny per spin on the reels of Watch the Birdie up to the maximum total bet of $75 per spin. Watch the Birdie has a decent enough betting range for most players, especially casual and low stakes players. There is an autoplay mode available for real money. To play the Watch the Birdie online slot, sellect your bet and hit the “Spin” button or to play all 15 lines with 5 coins per line, press the “Bet Max” button. The Jackpot symbol on the Watch the Birdie slot game is the Bird House symbol. If 5 Bird House symbols land on a selected payline, you will win the 1500 coin top jackpot. The second highest payout in Watch the Birdie is 1000 coins. You can win these jackpots on the Watch the Birdie slot machine when you play at Bovada! The wild symbol on the Watch the Birdie slot game is the Bird Egg symbol. The Bird Egg symbol is not only wild, but also an expanding wild. It will substitute for all symbols except for the Scattered Bird Watcher symbol. When it appears, it will expand vertically to cover the entire reel. The Bird Egg symbol only appears on reels 2, 3 and 4. It does not need to appear on an active payline to trigger the expansion. All wins pay left to right, except for scatter symbols (which pay any). The wild symbol substitutes for all symbols except for scatter symbols. 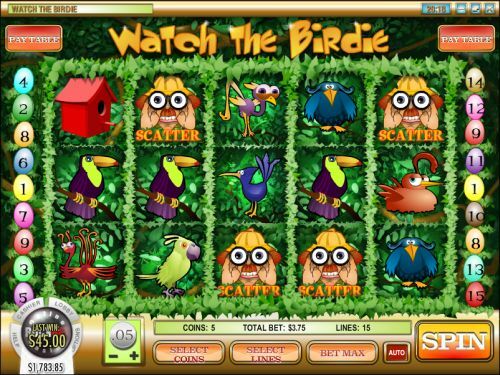 If you’re a bird watcher or a bird lover, you will enjoy the Watch the Birdie video slot. It doesn’t have a large top payout or anything, but it does have an expanding wild and a very good bonus game. You can play Watch the Birdie when you sign up and make a deposit at Bovada! Can players from the USA play the Watch the Birdie online slot game? 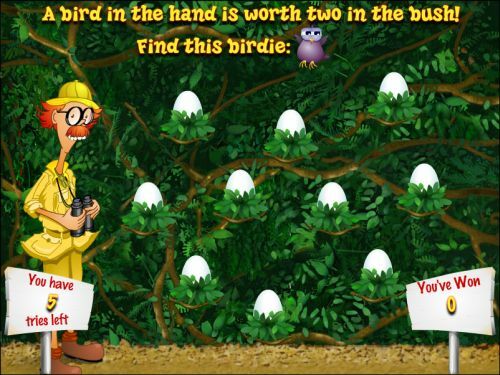 Where can I play a free Flash game of Watch the Birdie? You can play an Instant Play version of Watch the Birdie in your browser with no download required at Bovada. You can play it for free or you can play it for real money. If you experience problems with the Instant Play casino, make sure you have the most recent version of Adobe Flash Player installed on your computer.